MANILA — When six plainclothes policemen, hands gripping their holstered guns, charged down the winding alleys of the slum where Edwin Panis lives, he didn’t imagine they could be coming for him. Mr. Panis, 45, was drinking beer with friends near his shack on an embankment overlooking Manila Bay. A stevedore and neighborhood security officer, he hardly fit the profile of the drug addicts and dealers who have been targeted by the police since President Rodrigo Duterte took office — a bloody crackdown that Mr. Panis, like many Filipinos, supported. But in moments, he and his three friends were under arrest, hands cuffed behind their backs. Their offense: drinking beer in public. “The war on drugs has become a war on drunks,” Mr. Panis said bitterly, days after his release from an overcrowded cell. Two years into Mr. Duterte’s term, after thousands of killings by police officers and vigilantes in his crackdown on narcotics, the government’s campaign against crime has taken a new turn. Last month, Mr. Duterte authorized the national police to start arresting people for infractions like drinking in the streets, public urination or even being outdoors without a shirt — violations that were previously dealt with by neighborhood security officers like Mr. Panis. Since then, more than 50,000 people have been rounded up for such minor offenses. There has not been bloodshed of the kind seen in Mr. Duterte’s crackdown on drugs, though at least one detainee has died in police custody. 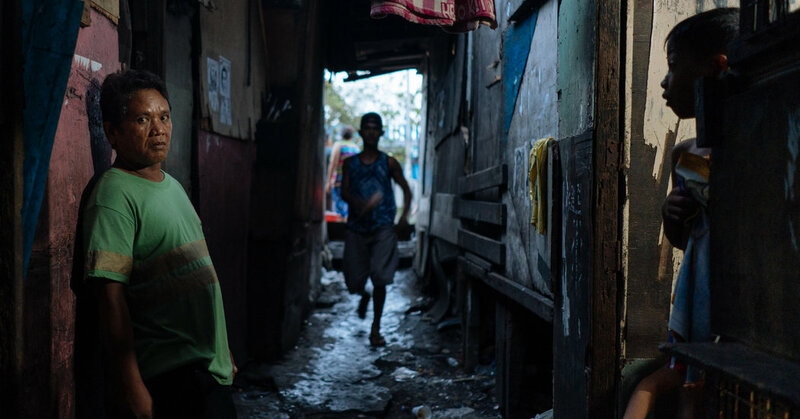 Still, in Manila’s slums, where most of the drug war killings have taken place, many now fear that the smallest infraction might cost them their lives. “There’s no way not to be scared,” said Amy Jane Pablo, 37, who lives near Mr. Panis in the Tondo slum and witnessed his arrest. The crackdown began immediately afterward. Within a week, the national police had arrested 7,000 people — Mr. Panis among them — for loitering, public drinking and other alleged violations of neighborhood ordinances. After his arrest, Mr. Panis was put into an outdoor cell so crowded that he spent the night on his feet, leaning against a few dozen other men who had been detained. The next day, they were bused to City Hall for a hearing and then released, told to wait for a subpoena to appear in court. “If they don’t like what you’re doing, they arrest you,” Mr. Panis said. Some have compared the crackdown to martial law — a sensitive subject in the Philippines, where the years of military rule under the dictator Ferdinand Marcos are still remembered. Mr. Duterte, an admirer of Mr. Marcos, imposed martial law in the southern Philippines after an Islamist uprising last year. He said martial law under Mr. Marcos, which lasted from 1972 to 1981, began with the enforcement of “ridiculous rules.” Men with long hair had their heads forcibly shaved and people who violated curfew were caught and punished. “It ended with the arrest, torture, detention and disappearance of so many young people who were branded as enemies of the state,” Mr. Diokno said. On a recent Friday night in Don Bosco, a neighborhood in Tondo, eight policemen on motorcycles patrolled the densely packed slum. Its residents live as much in the alleys as in their cramped, often makeshift homes, and they were outdoors late into the night, playing bingo, singing karaoke, cooking and otherwise whiling away the hours. The officers told children to go home, and they chased down men who had gathered around bottles of beer or gin. Within half an hour, they had picked up two men for not wearing shirts and four others for drinking on their doorsteps. “I’m just cooling off, sir,” one shirtless man protested meekly, before an officer ordered him onto the back of a motorcycle to be taken to the police station. There has been strong public opposition to the crackdown, fueled in part by what appeared to be particularly egregious arrests. A closed-circuit video of the police arresting a man who had briefly stepped outdoors without a shirt went viral. The death in custody of another man arrested for being shirtless — the specific offense is “causing alarm and scandal” — has led to calls for a Senate investigation. The police initially said the man, Genesis Argoncillo, 25, who was arrested just outside his home, had suffocated because his cell was overcrowded. But a photo of the corpse showed severe bruising, and an autopsy confirmed that he had died of blunt force trauma. Inmates later said Mr. Argoncillo had been beaten by other prisoners, and that he had lain on the floor for several hours before being brought to a hospital. Two inmates have been charged with his murder. Director General Oscar Albayalde, chief of the Philippine National Police, fired some officers who were involved in highly publicized incidents, but he said the crackdown would continue. Mr. Diokno, the lawyer, called Mr. Duterte’s backtracking an example of his tactics of obfuscation. “It just shows the naked truth about the kind of power that he’s wielding. It’s not a power based on law but a power based on fear and violence,” Mr. Diokno said, warning of “dark days” ahead.